Welcome to Cools Locker Room Pizza & Subs, providing restaurant services in Saint Marys, OH. We are a locally owned, family operated restaurant serving the greater St. Marys area. Stop by for our daily pizza specials, the biggest and best salads and the tastiest subs in town. 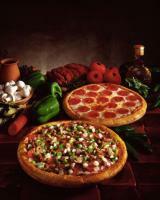 Visit us today and see why we're the "Grand Slam of Pizza!" We take cash, check, Visa, MasterCard and Discover. We have decades of experience in making excellent food for the local community and offering the best in customer care. When you dine in with us it will be like eating at a family dinner. We offer a fun, friendly atmosphere and will make sure you leave full and satisfied. Whether you need delivery, take out or dine in, we’re here to help. All you need to do is give us a call and we’ll take care of the rest.